Tabletop Academy Press, 9781892083203, 288pp. Filled with stories and illustrations, Let's Play Math offers a practical, activity-filled exploration of what it means to learn math. A mixture of educational philosophy, inspiration, and coffee-chat wisdom. Bestselling author Denise Gaskins provides helpful tips for all families with children from preschool or high school, whether they are homeschooling, unschooling, or attending a traditional classroom. Even if you struggled with math in school, you can help your kids practice mental math skills, master the basic facts, and ask the kind of questions that encourage deeper thought. How to Understand Math: Introduce your children to the thrill of conquering a challenge. Build deep understanding by thinking, playing, and asking questions like a mathematician. Playful Problem Solving: Awaken your children's minds to the beauty and wonder of mathematics. Discover the social side of math, and learn games for players of all ages. Math with Living Books: See how mathematical ideas ebb and flow through the centuries with this brief tour through history. Can your kids solve puzzles from China, India, or Ancient Egypt? Let's Get Practical: Fit math into your family's daily life, help your children develop mental calculation skills, and find out what to try when your child struggles. Resources and References: With so many library books and Internet sites, you'll never run out of playful mathematical adventures. All parents and teachers share one goal: we want our children to understand and be able to use math. 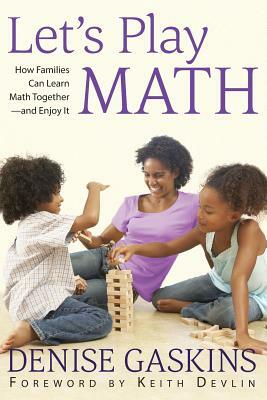 Your children will gain a strong foundation when you approach math as a family game, playing with ideas. Don't let your children suffer from the epidemic of math anxiety. Grab a copy of Let's Play Math, and start enjoying math toda. Denise Gaskins is a veteran homeschooling mother of five who has taught or tutored at every level from preschool to undergraduate physics. She loves math, and she delights in sharing that love with young people. "Math is not just rules and rote memory," Denise says. "Math is like ice cream, with more flavors than you can imagine. And if all you ever do is textbook math, that's like eating broccoli-flavored ice cream!" As author of the popular blog Let's Play Math, Denise helps parents and teachers open their students' eyes to the variety and richness of mathematics. Her articles and books explore the adventure of learning math as a mental game, playing with ideas.